CITT-Certified Logistics Professionals distinguish themselves—and the companies they work for and with—by their professional competence, character and conduct. Once every year, as a condition of their designation renewal, CCLPs also renew their promise to uphold CITT’s Code of Professional Ethics and recommit themselves to operating in ways that reflect the values of transparency and integrity. CITT recognises that supply chain and logistics professionals serve the public interest first and considers their responsibility to the betterment of society as paramount. CITT-Certified Logistics Professionals can only maintain their professional abilities and certified status if they commit to continuing professional development.The goal of a good professional designation program is to build the deepest, most solid foundation on which continuous learning can be added. Then enable it with a framework that supports the elite pros that embrace self-improvement. 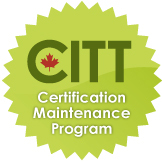 CITT-Certified Logistics Professionals demonstrate their commitment to continuous learning through participation in the CITT Certification Maintenance Program. Certified members are required to accumulate and report 50 certification maintenance units (CMUs) every two years. In order to maintain the CCLP designation and the right to use the CCLP credential, CITT-Certified Logistics Professionals also need to remain CITT members in good standing. The CITT Constitution, By-Laws and Board Policies require certified members pay an annual professional fee (member dues) as set by the board of directors.